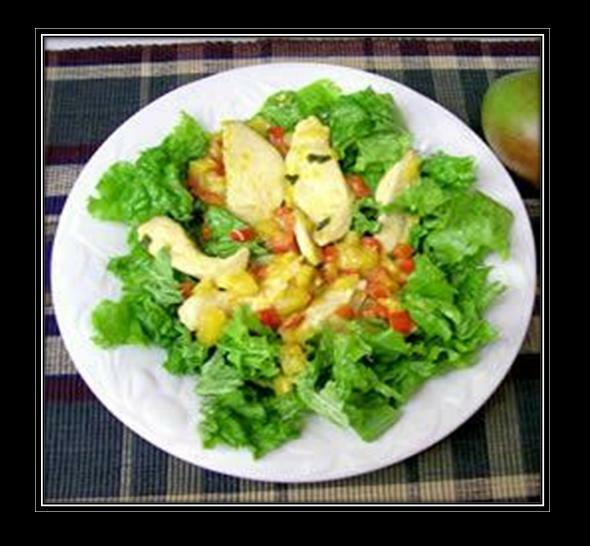 Simple to prepare and refreshing, this Warm Ginger and Mango Chicken Salad offers a stimulating taste resulting from healthy chicken and nutritious yogurt dressing. Moreover, the fresh mango slices taste great on their own. Warm Ginger and Mango Chicken Salad is a perfect side dish for relaxed lunches and dinners during searing summer days. Take a medium mixing bowl and place honey, lime juice, yoghurt, mango chutney, rice vinegar, cumin, coriander and paprika in it. Pick a large mixing spoon and mix all the ingredients thoroughly until completely coated. Your salad’s dressing is ready; set it aside until you prepare the salad. Set a medium sized frying pan on your stove over average heat. Pour in one tablespoon of olive oil and wait for a few seconds until thoroughly warmed. Place the minced ginger and skinless, boneless chicken breast fillets in the warm olive oil. Now, fry them for at least 7 to 10 minutes until the chicken pieces are no more pinker. Top the chicken-ginger mixture with mangoes, spring onions, and red pepper. Cook it for five more minutes until the recently added ingredients incorporate with the chicken-ginger mixture. Remove the frying pan from heat and pour the mixture into a large serving bowl. Pour in the previously prepared yogurt-dressing and toss gently to coat the ingredients. Top the salad with romaine lettuce and place in the refrigerator for a few minutes before serving. Natural Harvest: New Organic Food Store in Arvada NOW OPEN!